Cadlay Designs is an experienced PCB Design Bureau providing the complete package from electronic engineering through PCB Design, fabrication, prototype assembly and manufacture. Cadlay started as a Cadstar Design Bureau in 1987 and added Altium design services in 2011. Both products are maintained and upgraded to ensure Cadlay’s PCB Designers can offer the very latest high speed PCB layout services. 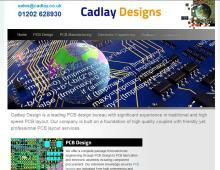 Contact Cadlay Designs - a top quality Printed Circuit Board Design Company. Cadlay are also a Product Design Company, keeping up to date with the latest & emerging technology to provide a first class electronic design service for new products. Both hardware and software electronic engineering services are available. Contact Cadlay Designs today to discuss your new product design and development.